World-Class Warehousing and Material Handling covers todays state-of-the-art tools, metrics, and methodologies for dramatically increasing the effectiveness, accuracy, and overall productivity of warehousing operations. Not long ago, effective warehousing was a relatively straightforward progression of receiving, storing, and shipping. But in the age of e-commerce, supply chain integration, globalization, and just-in-time processing, warehousing has become more complex than at any time in the past — not to mention more costly. 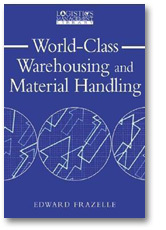 World-Class Warehousing and Material Handling provides the first widely published methodology for warehouse problem solving and provides an organized set of principles that can be used to streamline all types of warehousing operations. Warehouse Management Systems. Profiling activity, monitoring performance, and simplifying operations. Filled with proven operational solutions, it will help you develop a warehouse master plan designed to minimize the effects of supply chain inefficiencies as it improves logistics accuracy and inventory management, and reduces overall warehousing expense. Introduction: Why Have a Warehouse? Edward Frazelle, Ph.D., is president and CEO of Logistics Resources International, founder of the Logistics Institute at Georgia Tech, and director of the schools Logistics Management Series. The former president of the International Material Management Society and a pioneer in todays logistics movement, Dr. Frazelle has trained more than 50,000 logistics professionals and helped more than 100 corporations and government agencies in the United States, Asia, Europe, and Latin America pursue and achieve logistics excellence. World-Class Warehousing and Material Handling is guaranteed. If you are not 100% satisfied, you may return it within 30 days for a full refund.